By now you should know that to enter the Russian Federation you need to apply for a visa, unless you travel visa free on a cruise ship, or your country is part of a signed bilateral agreement with Russia, such as for the CIS (the Commonwealth of Independent States), as well as other states - please see the full list here. If your country is on the list mentioned on the link I gave you above, then you're lucky as you don't need to apply for a visa. On the contrary, if you're not on that list, then you must apply. There are different types of Russian visas to choose from, and as far as I know the majority of people tend to apply for the tourist visa. However, knowing which visa you need is very important as the application process is different for each type of visa application. It is also good practice to check all the Russian visa requirements before applying, and afterward get all the official paperwork together correctly, so that you submit your Russian visa application without any rejection. 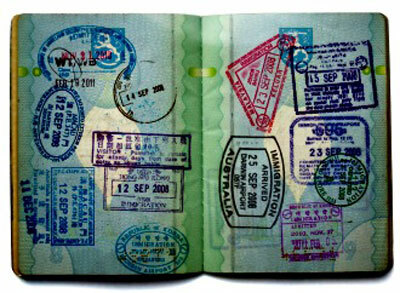 Generally, the type of visa that you need depends on the length of your stay and the purpose of your visit. Whether you plan to leave the country and return during the period that your visa is valid is also a factor in choosing the type of visa to apply for. And, don't forget that for each type of Russian visa, there are also different kinds of documentation that you must present to the Russian Embassy/Consulate before you apply. True, there is a lot of paper work involved! But don't panic because it isn't as hard as you think. Below you can find explanations of the conditions and requirements of the main types of Russian visa, as well as specific information on how to apply for each one of them. Travelling to Russia for pleasure? Then you need to apply for a tourist visa. See below! A passport with at least one blank page (two are better), valid for at least six months after the end of your proposed visit to Russia. Two copies of your Russian visa application form, completed and signed. A tourist confirmation (aka invitation letter/visa support) either from the hotel where you will be staying or from your travel agent (Russian or otherwise). A tourist voucher ((aka invitation letter/visa support), also issued by the hotel or booking agent. Travel insurance if you live in an EU country (except UK) or USA. A copy of a tourist/hotel voucher for a tourist visa. If you are in a tour group or with a cruise: you need to present a letter from the tour company or cruise line confirming the itinerary and including a copy of the confirmation from an authorized Russian travel company, which shows the reference number and confirmation number for the visa. Alternatively, if you are travelling independently: you need a confirmation of hotel arrangements from an authorized Russian travel company, or directly from the Russian hotel, showing a reference number and confirmation number for the visa. 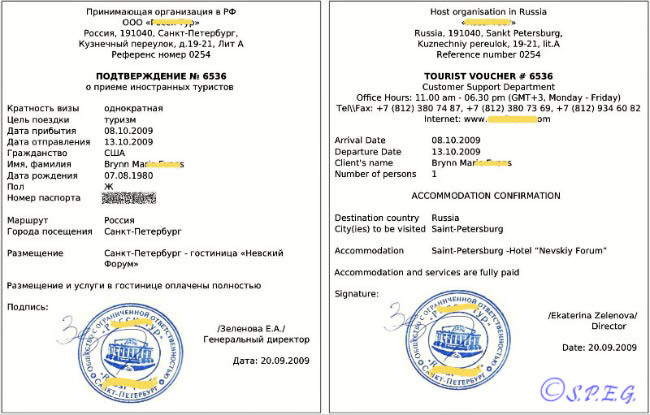 Generally, the Russian visa invitation (Visa support) for tourists consist of two separate documents: one is a hotel voucher showing your hotel reservation has been paid for (including reservations made with a credit card), the other is a tourist confirmation (stating that you are a guest at that hotel). You will most likely get these documents via an e-mail, and you then simply print them out for submission along with your visa application, passport, visa photo, etc. Travelling to St Petersburg for business? Going to visit an exhibition or sign up a contract? If so, you need to apply for a business visa. Your original passport with at least two blank visa-designated pages. Passport must be valid for at least six months after intended departure date from Russia. An introductory letter from you (if self-employed) or your company explaining the purpose and itinerary of your trip. Your bank statements for the last 3 months (if self-employed or unemployed). For a stay exceeding three months, or a multi-entry visa, an HIV test is required. When you apply for a business visa you must have an official letter of invitation from a Russian company and a cover letter from your company or organization (or yourself) stating the purpose of your Russian trip. The company should be officially registered with the Passport and Visa Department (PVU). Within three to four weeks, your business visa should be issued by the PVU at the Ministry of Internal Affairs, allowing you to stay in Russia up to twelve months. A copy of a business invitation for a business visa. In the event that you handle this type of visa personally, then make sure to have at least a double-entry or multiple-entry visa on it, and choose an agency that can provide registration of your visa in Russia and help you in exceptional cases. Bear in mind also that your business visa invitation must be original and include a seal, a signature, an address and the name of the inviting person. If you need an invitation, but don't have anyone to help you, don't worry. There are lots of agencies in Russia that will issue an invitation for a reasonable fee. Do you have a girlfriend or boyfriend, friends or relatives in Russia? Do you want to stay up to 3 months? If so, you need a private visa. Private Visas (also known as Homestay visas) are designed for those visiting friends or family in Russia, and allow them to stay on Russian soil up to 3 months. However, as the process is quite long (1.5 months) and very tedious (long queues, a lot of paper work, and many frustrations), it is normally easier to visit your Russian friends and relatives on a Tourist Visa. A passport with at least two blank pages (two are better), valid for at least six months after the end of your proposed visit to Russia. 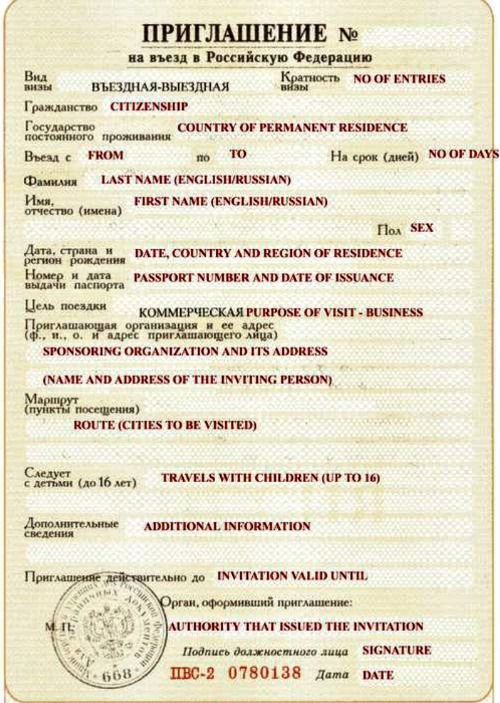 Visa entitlement certificate / Invitation (Priglashenie) from the local Immigration Office (UFMS) in Russia. Your host must obtain this certificate for you, and send you the original one. Your host will need to know: your full name, address, nationality, passport number, date of birth and your dates of arrival/departure in Russia. A copy of a private invitation for a private visa. If you want to apply for a Russian private visa, you need to call your Russian friends, relatives or Russian girlfriend or boyfriend and ask them to officially invite you over. Basically, anyone else you may know in St. Petersburg or Russia can do this for you. But remember, they all have to be Russian citizens because to start the process you need an invitation from a Russian citizen. And, don't think that your friend, or girlfriend or boyfriend will know what to do, because they surely won't. For him/her or anyone inviting you it will be probably the first time doing this, so it might be a painful process to digest. 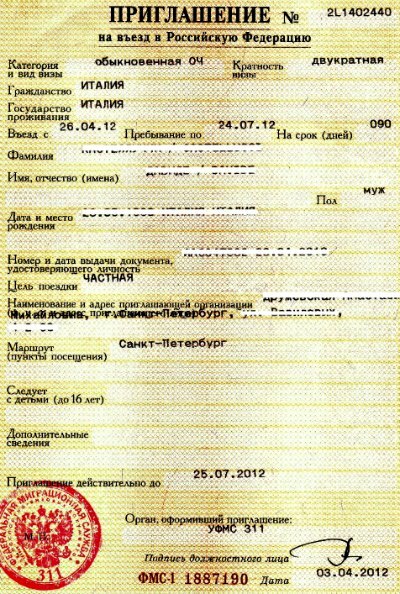 Official invitation for entry to Russia (original). Please note that student visas are obtained through the Russian Embassy (Consular Department) or Russian Consulate in your country of residence. In certain countries there are also authorized visa centers, which provide such services. For more information about how to apply for a Russian student visa Click Here. If you are just travelling to a third country via Russia, then you should apply only for a Transit Visa. Basically, if you stay less than 24 hours in Russia, and you do not intend to leave the airport transit area, you don't need to apply for Russian Visa, and you don't need an invitation letter. However, in all other circumstances, you need to apply for a Russian Transit Visa, normally valid for up to three days, if you are travelling by plane, or ten days, if you are travelling by train. 1. Your original passport with at least two blank visa-designated pages. Passport must be valid for at least six months after intended departure date from Russia. 2. Two copies of the Russian visa application form, completed and signed. 4. Visa to the country of destination, if required. 5. Tickets for the whole itinerary. For your information, the transit visa is usually issued for three days if you're crossing the country or need to change airports. The requirement and the prices depend on the country you're in, so the best thing to do is to contact the Russian consulate and they'll explain everything. Several stamps on the passport. However, if you travel by train and not by plane, the term of visa can be longer. For example, if you travel by train from Moscow to Vyborg, you can be given a visa for one day, to Sochi, Novorossijsk – for three days, to Zabajkalsk – for five days, to Nakhodka - for eight days and so on. Instead when traveling by car, you will get a visa for the term calculated in the following way: the full distance of your travel will be divided by 500 km. For example, if you need to drive 3000 km, you can get a visa for six days. Lastly, and very important, if you are on a flight through the territory of Russia and you need to change your flight (maybe you have a connecting flight), you can't leave the airport, unless you have a Russian transit visa. Therefore, make sure you have all the required paperwork in order before you travel. Keep in mind that even if Russia has visa-free arrangements with many countries (see the list on the link I share above), the duration of a visa-free stay is limited to 1 or 3 months, as such arrangements are designed for tourists, not long-term visitors. A Russian tourist visa lets you stay in the country for up to thirty days, with just one entry which cannot be extended while in Russia. Also, remember that you can get a visa for Russia only in the country of your citizenship, except if you hold a residence permit for another foreign country for a period of more than ninety days. Be aware that if you stay more than seven days in Russia you must register your visa within seven working days of arrival. However, if you’re staying at a hotel, the receptionist should be able to do this for you for free or for a small fee. Invitations for Business Visas are issued through the Russian Foreign Ministry or its regional representatives, or an appropriate branch of the Russian Federation Migration Service. When travelling on a cruise ship visa free to Russia, your tour guide must provide you with tour vouchers prior to your visit. This is a document (aka blanket visa), that replace the tourist visa for a short stay only (72 hours max), stating that an authorized tour operator is waiting for you outside the passport control area. You show this ticket along with your passport to the passport control officer and you are free to go. Learn more about Russian visa invitation, and get yours Here. You should know that by Russian law, your hotel must provide you with the invitation letter or visa support document, which usually is presented as a hotel confirmation. Hence, if you book your hotel via booking.com, make sure you ask the hotel to send you an invitation letter before you apply for the Russian visa. We've tried to give you a complete brief overview about all kinds of Russian visas, though as you can imagine the topic is quite wide. However, if you still have some doubts or questions, try to read our tips and recommendations below, or much better, get in touch with your nearest Russian embassy. You should consider the type of visa you want to apply for. Most travellers get a tourist visa, because it allows you to stay in Russia for up to thirty days. However, if you need to stay longer or travel to Russia several times, then getting a business visa may be a better choice because you can have multiple entries. However, if you are just coming for a short business trip, then it will make more sense to apply for a tourist visa. 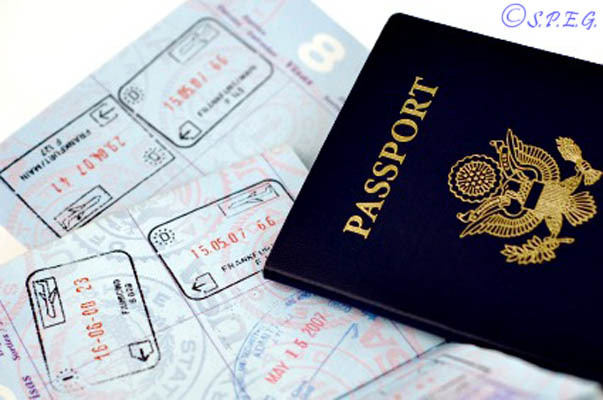 The most convenient option among all Russian visas (tourist, business, student, private, transit, work) in terms of price, processing speed and flexibility are tourist and business visas; though between the two, the processing speed of the business visa is longer and more expensive than the tourist visa. Remember, Russian officials usually don't care about which visa you finally take, what matters is how much you pay. So, when you choose the type of visa, you should evaluate carefully the price of the visa, its speed of processing, the period of stay and the number of entries the visa allows. Keep in mind that to start your Russian visa application you should know by now that you need an invitation (also called visa support document) issued from a third party. However, we advise you to give only the original invitation to the Russian consulate when applying for business or private visas. This way you will avoid any possible rejection. Don't forget to register your Russian visa within seven days upon arrival, excluding holidays and weekends. Russian law says that it is the responsibility of the accommodating party to register your visa once you arrive; so your hotel, hostel or friend should take care of this, but to be sure, always ask. If you are going to St. Petersburg on a ferry with St. Peter Line, no visa is required from your side, if you comply with the visa free rules. From Russian Visas return to Visa to Russia, or go back to the Homepage.